Today Skyfire, creator of the blockbuster mobile browser with over 13 million downloads to date, is introducing a solution that will ease your tablet sharing pain. Skyfire HotSwapTM is a new breed of mobile browser that allows for up to four users to save and preset their browsing preferences for seamless profile swapping across the full web. Skyfire’s mobile browser – the Apple App Store’s #1 paid iPad Utility of 2011 – is now also the iPad’s most family-friendly web browser. Skyfire HotSwapTM is integrated into Skyfire’s award-winning mobile browser for the iPad and aims to solve one of the biggest drawbacks of a family device like the iPad: a lack of user accounts to facilitate sharing between friends and family. Skyfire HotSwapTM allows each person to set up a separate account within the mobile browser, eliminating the tedious log out, log in and set-up process for each of your favorite sites every time the iPad changes hands. With HotSwapTM, family and friends can share an iPad and swap to their own personal profile, with easy access to browsing preferences and social settings for up to four separate users. Bookmarks, history, open tabs, social network logins like Facebook and Twitter, email accounts like Gmail, Amazon accounts, and settings reappear just as they left them. Simply leave the iPad on the coffee table for the next user to swap to their personal profile. Skyfire is dedicated to leveraging the power of cloud computing to improve radically the mobile Internet experience for both Operators and Consumers. Skyfire’s solutions provide game-changing cost savings, better end-user experiences, and compelling incremental revenue opportunities. Skyfire was recently recognized as no. 4 on Light Reading’s 2011 Startups to Watch list, and by OnMobile as a Top 100 Private Company. As both a laboratory and showcase for new capabilities, Skyfire has honed its technology through a variety of consumer apps, which have more than 13 million downloads to date. 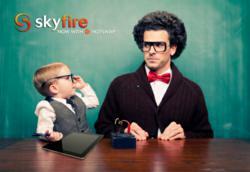 Follow Skyfire on Twitter at http://www.twitter.com/skyfire. NOTE: Skyfire and Skyfire Rocket are trademarks of Skyfire Labs, Inc. All other registered or unregistered trademarks are the sole property of their respective owners.